We started the week talking about the Harry Potter Exhibition coming to Valencia this April, so to continue with this week’s magical theme today we are talkinga bout Harry Potter movies. In a previous blog entry we talked about how TV show are great for learning Spanish (or any languge) and so are movies. While watching movies or TV series isn’t a substitute for a good Spanish teacher, it is a good way to still learn the language while relaxing on the sofa after a hard day at work or at school. One of the most popular movie series by far is Harry Potter, you know, those movies about magic schools, magic wands, magic flying brooms, magic flying cars and… even magical toilet portals. They are also know for having one of the most hated villains in movie history, but today we are not going to talk about Umbridge, we are going to talk about Voldemort and his many names. 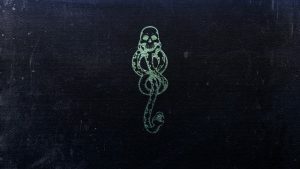 For anyone who maybe hasn’t seen the movies or doesn’t remember: Voldemort is the main villain in the series and goes by many different names like You-Know-Who, He Who Shall Not Be Named, Tom Marvolo Riddle and… many more. 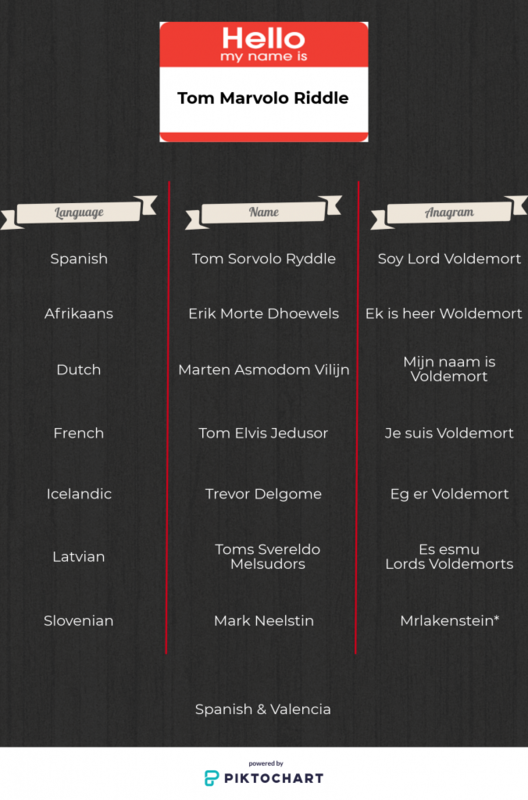 Voldemort is actually French and means something like “death’s flight” or “flying death” and is an anagram of his real name, so when moving the letters in “Tom Marvolo Riddle” it would result in “I am Lord Voldemort”. However, as you can probably imagine, this can only work in so many languages so in most of the movies’ translations some adjustments had to be mane to both the name and the resulting anagram. *The name has been changed to look like Frankenstein, and Mrlak would be an allusion to death.